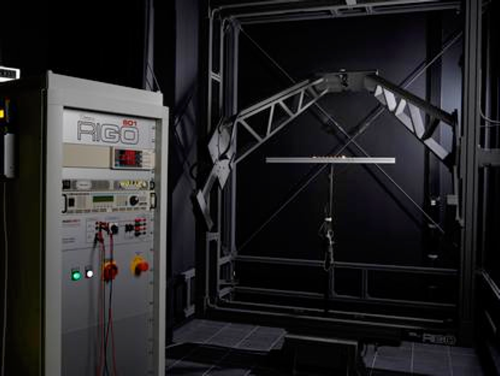 The near-field goniophotometers of the series RiGO801 measure luminous intensity distributions, ray data, luminance distributions and spectral data of LEDs up to large luminaires. 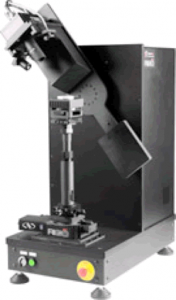 The measurements are enabled through a camera-based measuring technique in the case of which a luminance measuring camera is moved around the object to be measured, with the measuring distance being small. Thus, particularly compact measuring systems can be realized. The smallest goniophotomter of our product range is a compact desktop unit designed especially for measuring the ray data of small light sources, in particular of LEDs, LED modules and OLEDs of a diameter up to 200 mm. The object to be measured is mounted on a vertical rotary axis (phi). The camera and the other sensors, which are mounted on an arm, move around the measurement object on a circular arc (theta axis). The light source is positioned by an x/y/z translation stage which displaces the upper rotary axis. The rotary axis is provided with a universal plug-in connector to which various measurement fixtures can be linked. Due to the extremely high position accuracy of the measured ray data, this goniophotometer is well suited for the ray data measurement of LEDs. Besides the ray data, also the luminous intensity distribution, the luminous flux and spectral/colorimetric data (option gonio-spectroradiometer) are measured as it is the case with all types of RiGO801 goniophotometers. The sensors are moved around the measurement object on a circular path (horizontal axis, theta). The object to be measured being in an upright position is rotated on a vertical rotary axis (phi). This free-standing type C goniophotometer has a maximum measuring volume of a diameter of 300 mm, and is well suited for measurement objects ranging from LEDs/OLEDs and lamps up to small luminaires. The measuring camera and the other sensors being mounted on two axes linked with each other are moved on a spherical surface around the stationary object to be measured. The goniometer is mounted in an external frame in an entirely pivotable manner so that vertical just as horizontal burning positions can be set. This is particularly important for measuring automotive lamps as a stable horizontal burning position is urgently necessary here. The high position accuracy of the ray data measured allows the ray data measurement of light sources from the size of a power LED on (chip surface area from approx. 1×1 mm² on). The luminous intensity distribution and the luminous flux of much smaller light sources can still be measured as the measurement will then be carried out by the photometer in the far-field mode. With the option goniospectroradiometer spectral and colorimetric data can be measured according to LM79 and EN13032-4. 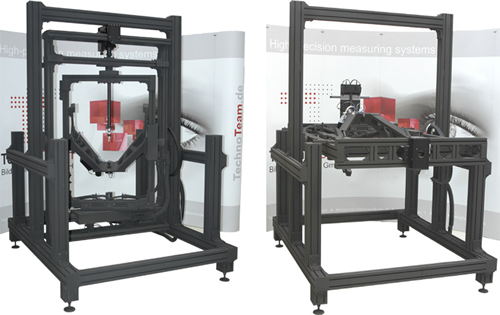 This free-standing type C goniophotometer has a maximum measuring volume of a diameter of 600 mm and is well suited for measurement objects ranging from LEDs to small luminaires. The measuring camera and the other sensors mounted on two axes linked with each other are moved on a spherical surface around the stationary object to be measured. The high accuracy of the ray data measured (< 0.1 mm) allows the ray data measurement of light sources of a size from a power LED on (chip surface area from approx. 2×2 mm² on). The luminous intensity distribution and the luminous flux of smaller light sources can still be measured as the measurement will be carried out by the photometer in the far-field mode. With the option goniospectroradiometer spectral and colorimetric data can be measured according to LM79 and EN13032-4. The large goniophotometers can be employed for measuring light sources ranging from small LEDs/OLEDs to large luminaires. They are available in different sizes. The currently available standard sizes (diameter of measuring volume) are 1400 mm, 1500 mm, 1800 mm and 2000 mm. The kind of device to be chosen mainly depends on the product range to be measured and on the size of the available laboratory room. Customized designs are possible at corresponding additional costs. The measuring results are the LID, the luminous flux and for light sorces larger than 100 mm also ray files. Very small light sources are measured directly usinf the illuminance meter in far-field mode. In case of an available spectroradiometer (option), gonio-spectrometric measurements (angular dependend and mean color coordinates, CRI, SPD, …) conform to LM79 and EN13032-4 can be performed. The evaluation of lumiance and color images is possible by using the program LMK LabSoft. The goniometer mechanics includes an external, vertically rotating frame (phi – axis), in which a horizontally rotating arm is mounted (theta – axis). At the end of the internal arm, the measuring sensors are mounted. During the measurement, the object to be measured – which can be mounted either in a hanging or upright position – remains stationary. This setup is conform to LM79 requirements. 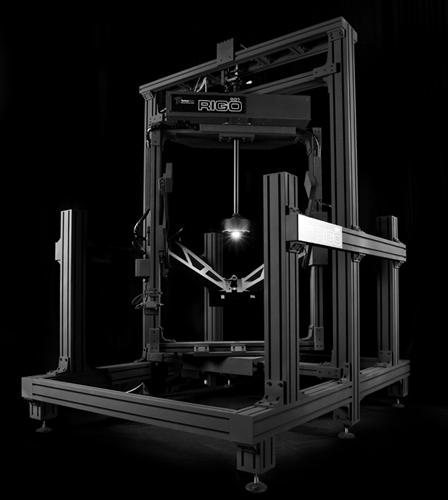 In the case of these systems – as opposed to the smaller, self-standing goniophotometers – the external rotating frame must be fixed to a ceiling construction. For detailed information, please refer to our laboratory specification.